Cost savings estimated at $2.5M - Due to elimination of all piling on site, reducing the raft thickness from 1500mm to 1000mm under the tower, and using large pad footings with a slab on ground elsewhere. The lightweight structure designed by the Pritchard Francis team also added to this, with steel beams and planks allowing for fast floor cycles and reducing weight on the foundations. Steel frame with precast plank solution. Post tension design for waterproofing to podium levels. Finite analysis of the foundations to interact with the structural solutions. Modular stormwater tank for stormwater treatment and compensation. Runoff from building partially filtered through 'pebbles' on the podium to improve water quality. 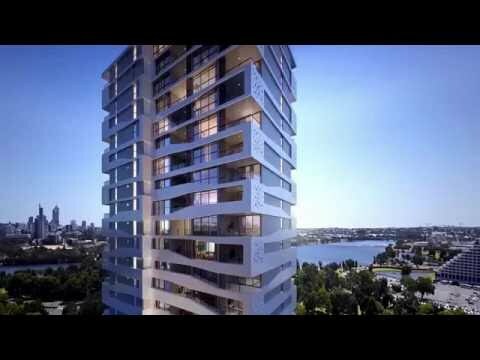 Hawthorne Green is a new mixed use multi storey residential development, located on Hawthorne Place in Burswood, approximately 4km southeast of the Perth CBD. SKS Group engaged Pritchard Francis to provide structural and civil engineering consultancy services for the project, to modify the original design to suit their current budgets and construction timeframes. The scope involves construction of an 18 storey tower, including two podium levels with a roof deck. Level 1 will house commercial units and a car park. Level 2 consists of residential parking bays, and Levels 3 to 18 will comprise 137 residential apartments. Due to the poor soil conditions around the Burswood peninsula, Pritchard Francis developed a lightweight steel frame solution with concrete precast planks to reduce the weight of the building to approximately 70% when compared to a traditional full concrete design. This reduction in weight allowed the engineering team and geotechnical team to work in conjunction to establish an alternative foundation design rather than the traditional fully piled approach. This alternative will provide the solution for a much faster and cheaper building development. The light weight solution in the tower will allow modularisation of the steel and planks which will lead to a faster floor to floor construction process compared to a typical insitu design. Due to the high groundwater table, it was not possible to infiltrate stormwater runoff insitu. Instead, the Pritchard Francis team negotiated with the Town of Victoria Park to connect into their existing piped system at a limited outflow rate. A package stormwater detention tank was proposed situated within the ground floor of the development and an orifice plate to control the discharge. Pritchard Francis coordinated with the hydraulic consultants to ensure building runoff was directed to the holding tank.